Auburn University’s College of Veterinary Medicine is fortunate to count some of the finest technicians in the veterinary world among its employees in the teaching hospital, and this week is celebrating some of its hardest working and most devoted practitioners. Since 1993, the National Association of Veterinary Technicians in America (NAVTA) has celebrated National Veterinary Technician Week, as a way to recognize the men and women who support veterinarian clinicians and veterinary students, and give personalized and continuous care to patients. 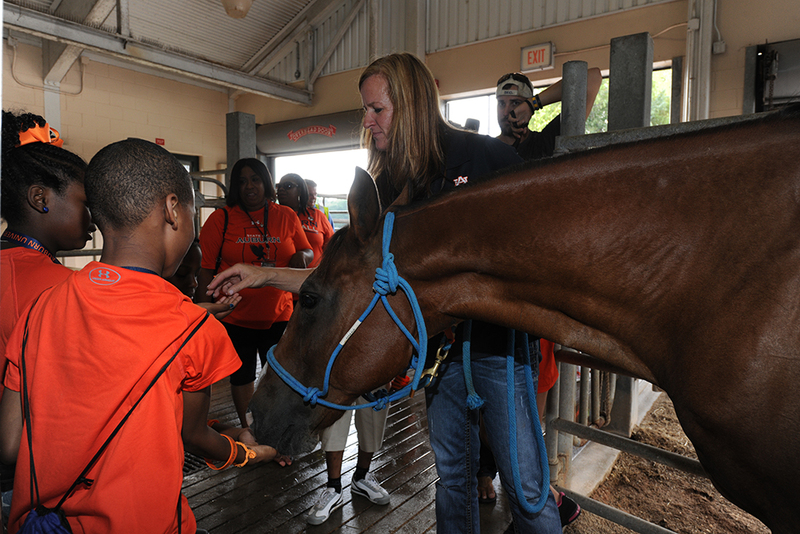 Erin Robbins supervises as students from Chicago’s New Schmid Elementary School interact with a horse. The college is proud to have so many excellent technicians on its teaching hospital staff, without whose work and professional excellence, the care of patients would not be possible. Vet techs frequently meet with clients, assist faculty clinicians with medical procedures, texts and exams, and are important mentors in a veterinary student’s clinical education. “Vet techs help take the load off of the physicians. We spend one-on-one time with the patients continuously, providing daily care, so that the doctors can focus on their treatment and future care,” said Erin Robbins, equine service lead technician at the JT Vaughan Large Animal Teaching Hospital. In many cases, vet techs are required to act autonomously, taking steps independent of a veterinarian’s direct supervision to ensure the well-being of patients. For this reason, vet techs have to be skilled, professional, and devoted to their patients. 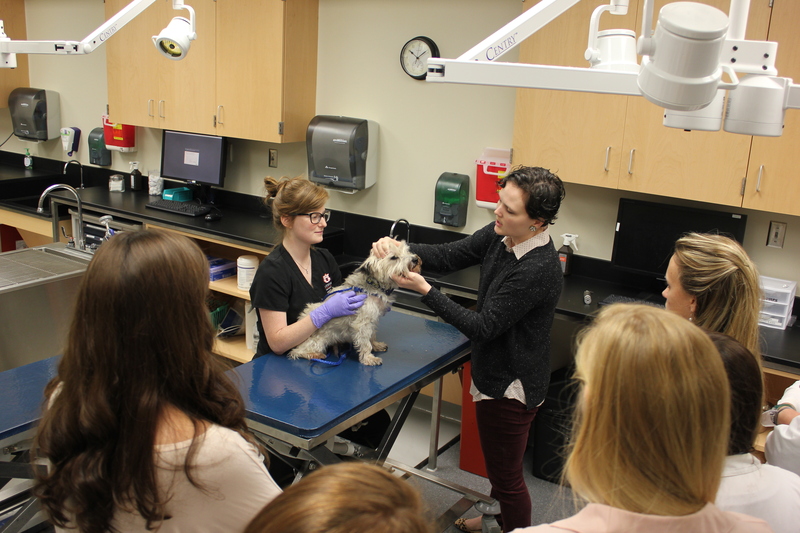 In addition to performing their own duties, vet techs at the college are involved in teaching veterinary students as well. Since this may be the first time some students have been able to interact with vet techs in a clinical setting, this interaction is key. Erin Ellis, a technician in the neurology and neurosurgery service of the Bailey Small Animal Teaching Hospital, says interacting with the students is one of the best parts of her job. Erin Ellis (Left) assists Dr. Amanda Taylor during a demonstration for students in the neurology service. Vet techs come from a variety of backgrounds and experiences, and like the veterinarians they support, techs can specialize in different areas of veterinary medicine. The common divider that unites them all is their love and dedication to providing their patients with the care and attention they need to get well. “We have a great group of techs. Whether licensed or not, everyone has a unique viewpoint and a unique set of skills. We’re all better because we’re all different,” Robbins said. Though technology will progress, and medical techniques will improve, one thing that will not change is the invaluable role that veterinary technicians serve in ensuring that animals are treated with the utmost care, and that the human/animal bond continues to deepen. They truly are the backbone of veterinary medicine. To learn more about National Veterinary Technician Week, and how you can support veterinary technicians and the animals they care for, go here.